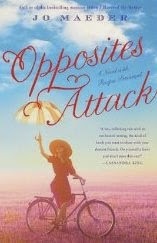 My review today is for Opposites Attack: A Novel with Recipes Provencal by Jo Maeder. This book is a tasty summer treat that will whisk you all the way to Provence where you will want to stay forever. American Alyce is searching for change in her life. She takes herself to Provence and enrolls in an intensive language course to immerse herself in French culture and more importantly, she hopes her absence from his life will be enough to have her boyfriend Nelson crossing the Atlantic with a huge ring for her finger. In her mind she will have gained that mystical French ‘je ne sais quo’ and they will live happily ever after. However, Alyce has problems. French isn’t as easy to learn as she first thought. She has hilarious issues with her host families and boyfriend Nelson, when he does make an appearance, has quite a bit of baggage. Alyce finds herself living in the guest cottage of troubled, sultry author Jean-Luc – American hater, in debt, suffering from writer’s block and with an inability to rid himself of elegant hanger-ons. They are an unlikely pairing but Alyce and her antics awaken something in him. He finds himself duty bound to educate her American palate in the delights of French cuisine. Each dish he illustrates is deliciously described within the novel and in more detail (with added spice) at the end of the book. I thought it was good fun, with good food and good company. It was a quick and easy read that had me putty in Jean-Luc’s hands and missing the antics of Alyce once I’d finished the book. Opposites Attack: A Novel with Recipes Provencal is available in ebook and paperback and links to Amazon are below.